The website was nearly finished and as a growing web designer, I had to say it was my best yet. the top right corner that encouraged visitors to click. My client loved it. I loved it. But, as I worked through the final stages of the site, I found I faced a problem I couldn’t figure out. The responsiveness, or the flexibility for the site to appear well on different devices like smartphones, tablets and laptops was out of whack. This was a whole new stage of web development for me, and it definitely left me banging my head against the wall. I watched a few tutorials and sent out a cry for help to my WordPress theme creator, but for the most part, I was stuck. If you’re anything like me, when you’ve got something that doesn’t work right ­– something you just don’t understand – you can’t rest very well. Problems I can’t solve tend to fill my head with questions, and I find myself becoming a bit too consumed in my pursuit of an answer. “Call to Me, and I will answer you, and show you great and mighty things, which you do not know” Jeremiah 33:3. Aha! The scripture comforted me beyond measure. All was okay, because God knew the solution to my problem and he would guide me to my answer. One thing that has amazed me as I’ve been venturing out in this high-tech field of web design is that the God of the Bible knows it already. The God of the days of Abraham, Joseph and Moses with their ram in the thicket, coat of many colors and burning bush, knows the computer languages of HTML, PHP and MySQL. I’m sure of it because many times I’ve prayed for clarity through it all and God has provided an answer for me. Sometimes a solution will just pop into my head and other times he uses people to help me who have walked this road longer than I have. I few weeks ago, after listening to a tutorial on WordPress, the host, Wendy Cholbi, said that she holds a free office hour every week where she helps people with their web design questions. Wendy’s name came to me after I had prayed about my website problem the other day. And so, after juggling a few family responsibilities, I called her halfway into her free hour that week. As I called, I prayed for favor and for Wendy’s availability. I was certain that half the nation probably called her at the time. When she picked up the phone, a sense of relief washed over me as I shared my problem. Wendy graciously walked me through to a solution, and I cheered when my client’s website began to respond perfectly. 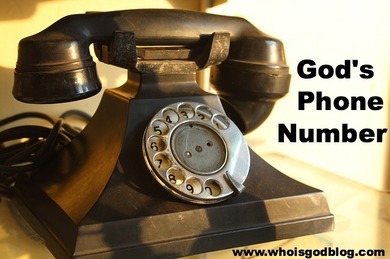 When I shared my story with my friend Sue the other day, she recognized the scripture God gave me and told me that some people call Jeremiah 33:3, God’s phone number. And she smiled when she realized that my problem had to do with smartphones! Now I know that you may not be facing a problem with your website’s coding today, but I do know that all of us face big things – tough things that we can’t seem wrap out heads around. I know, because I’ve got those kinds of problems too. Plenty of them. One problem I’ve got has my face planted against a hard rocky wall so tightly that I can practically taste gravel. I don’t know how to get around my situation, and I have no answer. But, I do know somebody who does, and I’m trusting that in his timing and in his way, he’ll lead me to a solution. “Teach me things I do not know,” I hear myself crying out to God as the days pass, and I wait for his wisdom. How about you, are you facing something big today that you’re not sure how to handle? Let me give you God’s number. 12 Then you will call upon me and come and pray to me, and I will hear you. 15 He shall call upon Me, and I will answer him; I will be with him in trouble, I will deliver him and honor him.